Last November, oil industry representatives huddled with conservative state lawmakers at a hotel a few blocks from the White House. The gathering was a covert affair. Reporters were barred from the room. Attendees cast votes in secret. The meeting was organized by the American Legislative Exchange Council, the conservative bill-writing group. A topic of discussion was the federal electric vehicle tax credit, which allows people who purchase EVs to receive up to $7,500 after filing their tax returns. Representatives of the oil industry — including those from Marathon Petroleum Corp., the nation's largest refiner — spoke out against the tax credit, according to people in the room. The attendees ultimately voted to support a resolution calling for Congress to scrap the popular subsidy. The resolution was largely symbolic. Senate Environment and Public Works Chairman John Barrasso (R-Wyo.) had already introduced legislation that year to kill the EV tax credit and impose a new fee on people who drive EVs. Still, the episode showcased the oil industry's pushback on a key trend in the transportation sector: the rise of electrification. Recent scientific reports have warned that greenhouse gas emissions need to be dramatically curbed if the world wants to avert the worst consequences of climate change. The reports note that EVs will play a crucial role in reducing emissions from transportation, which is now the country's largest source of carbon dioxide. The oil industry has an obvious financial reason to fret about these reports: EVs don't run on gasoline, so they cut into their profits at the pump. Barrasso reintroduced the "Fairness for Every Driver Act" last month, saying in a statement that the measure "levels the playing field for all cars across America" (E&E News PM, Feb. 6). The oil industry has cheered the measure. "We are supportive of Chairman Barrasso's bill," said Derrick Morgan, senior vice president for federal and regulatory affairs with American Fuel & Petrochemical Manufacturers. "In our view, we don't have any complaints with electric vehicles per se. We think that Americans should have a full range of choices and that government should stay out of favoring particular technologies." Tom Pyle, president of the Institute for Energy Research, said: "We absolutely support the effort by Sen. Barrasso. We think consumers should have choices. There's a market for electric vehicles, and there will continue to be a market for electric vehicles without the tax credit. All we're saying is let the free market work." Environmentalists, however, fiercely oppose the measure. They see the EV tax credit as a key tool for curbing planet-warming emissions from automobile tailpipes. And they see Barrasso as catering to the oil industry. "Mr. Barrasso is proving that he's the perfect shill for the oil industry," said Dan Becker, executive director of the Safe Climate Campaign. "He takes their money and he helps them run the competition off the road." The same companies that attended the ALEC meeting have also been busy lobbying Congress to scrap the EV tax credit. AFPM, the trade association representing refining and petrochemical industries, reported spending $80,000 on the EV tax credit and other issues during the last three months of 2018. And Marathon Petroleum Co. LP, the nation's largest refiner, reported spending $910,000 on the tax credit and other matters, including Barrasso's bill. Since coming to Congress in 1995, the Wyoming lawmaker has received more than $1 million from the oil and gas industry, according to data compiled by the nonpartisan Center for Responsive Politics. The only industry that donated more was health care. Barrasso was the top recipient of donations from AFPM in 2018, according to the Center for Responsive Politics. He was also one of Marathon's and Koch Industries Inc.'s preferred lawmakers, receiving $15,000 and $15,400 from those organizations, respectively. Mike Danylak, a Republican spokesman for the Environment and Public Works Committee, said in an email: "The electric vehicle market is firmly established. By any measure it no longer needs propping up by taxpayers. Chairman Barrasso will save billions in taxpayer money by ending electric vehicle tax credits." Danylak declined a request to interview Barrasso. Asked for comment, Marathon spokesman Chuck Rice told E&E News the company's lobbying on the EV tax credit was "minimal." "Consistent with our free market principles, Marathon Petroleum supports efforts to remove or limit subsidies for electric vehicles," Rice said in an email. "While our advocacy surrounding the EV tax credit were minimal, we disclose our lobbying efforts as required by law." The EV tax credit hasn't always been a partisan issue. It owes its existence to another Western Republican. The subsidy was created in 2007 through legislation offered by then-Sen. Orrin Hatch (R-Utah), who saw EVs as helping to curb U.S. dependence on foreign oil and boost national security. In a speech introducing the "Fuel Reduction Using Electrons to End Dependence on the Mid-East (FREEDOM) Act," Hatch stressed that the tax credit was designed to be temporary. "I want to emphasize that like the tax credits available under current law for hybrid electric vehicles, the tax incentives in the 'FREEDOM Act' are temporary," Hatch said. "They are needed in order to help get these products over the initial stage of production, when they are quite a bit more expensive than older technology vehicles, to the mass production stage, where economies of scale will drive costs down and the credits will no longer be necessary." More than a decade later, people continue to squabble over whether the tax credit is still necessary. EVs accounted for less than 2 percent of car sales in the U.S. last year. ALEC members decided the incentive isn't needed. Attendees of the ALEC meeting cast secret ballots on the resolution, which called for "equalizing the tax treatment of different types of vehicles by supporting the end of the $7,500 federal tax credit for electric vehicles." An E&E News reporter was barred from entering the room, but two attendees described the vote on the condition of anonymity. One recalled that the resolution incited a debate between utilities and refiners. Utilities opposed the resolution because they were seeking to invest in EV charging infrastructure, while refiners supported the resolution because they viewed EVs as a threat to their bottom line, the source said. Utilities were represented by the Edison Electric Institute. In the refiners' camp were Marathon, AFPM, Koch Industries and the Koch-affiliated Institute for Energy Research. "This was a smackdown between utilities and oil over the future of transportation costs and owning the transportation market," the attendee said. "Electric vehicles are moving people off of oil and onto coal and natural gas in most places. That's where the pressure points are." Another attendee recalled that most ALEC members were in favor of the resolution, with the exception of the utility interests. "I think most people were in favor of the resolution and eliminating the subsidy," that person said. "The conversation actually was not as robust as I would've liked it." A spokesman for EEI declined to comment. Democrats are looking to hit the brakes on the Barrasso legislation. Rep. Peter Welch (D-Vt.) introduced a measure last year to extend the tax credit through the end of 2028. H.R. 6274 would also allow consumers to claim the tax credit sooner, rather than waiting until they file their annual income tax return. A spokeswoman for Welch said the lawmaker plans to reintroduce the bill in the 116th Congress. In the meantime, House Democrats are exploring other ways to extend and expand the credit, which wasn't included in the tax extenders bill released by the Senate Finance Committee last week. "We're at a critical point for the future of the EV tax credit," Rep. Debbie Dingell (D-Mich.) said at a National Press Club event last week (E&E News PM, Feb. 27). "Giving up on that now," Dingell added, "is a mistake." Some automakers are also fighting the Barrasso bill. The EV tax credit expires after a U.S. automaker has sold 200,000 eligible vehicles. Tesla Inc. and General Motors Co. have both hit that threshold, and they're now lobbying Congress to extend the cap. GM recently added lobbying muscle, hiring the firm Ballard Partners, according to a Senate lobbying registration form. One of the lobbyists listed on the form was Pam Bondi, an ally of President Trump and the former attorney general of Florida. 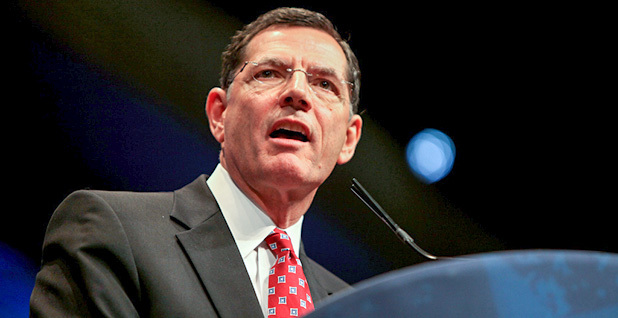 Environmentalists have accused Barrasso of hypocrisy. They say that if the Wyoming lawmaker were serious about leveling the playing field, he would go after even larger subsidies for fossil fuels. "Mr. Barrasso's judgment seems to be clouded by his donations from the oil and gas industry," said Ben Jervey, a researcher for KochvsClean.com, a watchdog project that investigates Koch network campaigns against clean energy policy. "He is targeting a relatively inexpensive tax credit for the purchase of electric vehicles and ignoring much, much larger tax breaks that are given annually to the oil and gas industry that total at least $3.7 billion," Jervey said. By contrast, the EV tax credit cost $670 million in 2017, the latest year for which data are available, he said. Another point of contention: Greens say Barrasso and his allies are cherry-picking data to back up their claims. Barrasso and his allies frequently cite the statistic that 80 percent of people who claim the EV tax credit earn more than $100,000 a year. "This expensive program disproportionately subsidizes wealthy car buyers," the Wyoming lawmaker wrote in an opinion piece for Fox News earlier this month. "Eight out of 10 electric-car tax credits go to households earning at least $100,000 — buyers who don't need a subsidy." Morgan of AFPM also cited this figure. "That's pretty eye-opening when you think about the fiscal state of the country to be spending up to $7,500 on these vehicles for mostly wealthy people," Morgan said. "It is poorly designed public policy." The statistic comes from the Congressional Research Service. Greens don't dispute the validity of that source, but they say the metric has been taken out of context. "The other thing is that the average household income for someone who buys a new car is around $80,000," said Ben Prochazka, vice president of the Electrification Coalition. "So it's about people who buy new cars and that they tend to have a much higher household income than people who don't." He added, "In the technology adoption curve, it's always people who have higher household incomes who are at the front of that adoption curve. They can afford some of the challenges that might come up from trying new technology." Ultimately, Prochazka stressed that EVs are still in the early stages of adoption, and the tax credit helps make them more affordable for everyone. That, he said, is the true meaning of leveling the playing field.